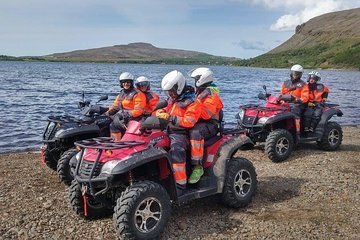 Experience the fun of an adrenaline-pumping 2-hour tour by all-terrain vehicle (ATV) through the Icelandic countryside near Reykjavik. Your expert guide leads you to the top of Mt Hafrafell and Mt Úlfarsfell where you enjoy breathtaking views of the Reykjanes peninsula, including Mt Esja the Hengill geothermal area, the city of Reykjavik and Faxaflói Bay. Expect to cross rivers and scale mountains on your sturdy ATV, with all equipment included. You can even visit a local farm and see animals such as horses, sheep and chickens. We had the pleasure of Ziggy being our tour guide. He easily made this experience very enjoyable and unforgettable. He was fun, professional, and extremely knowledgeable. He even let us stop at a local farm to feed the horses! My boyfriend and I are still talking about how we rode the ATV right through a huge rainbow! It was such an amazing day. Thanks, Ziggy! LOVED THIS. I only wish it were longer! Took this trip because our whale watching trip was cancelled due to bad weather. We knew we weren't going to see any views but took the trip for the riding experience. It was so much fun. The guide took us through what we needed to know and then we were off. Not cheap but then you are in Iceland so you know what to expect. Would highly recommend. Pretty awesome way to see Iceland from another perspective. I was the only one on the tour so that makes it even more spectacular. We had a fantastic time on our ATV ride. Our guide, Kristjan, was knowledgeable about the country and made our experience a lot of fun. The tour let us see the beauty of the area surrounding Reykjavic. 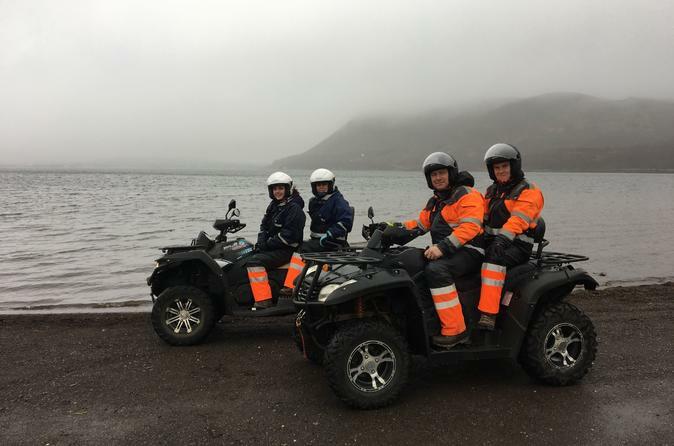 We recommend calling Kristjan if you are wanting a personal, exciting, and fun ATV experience! My family had a great time on this ATV tour. Kristian spelling?, the owner of the company, picked the five of us up on time and showed us how to operate the ATV's, since none of us had any experience. He took us directly to the garage on his farm, where the ATV's are kept...not fancy or anything and there was no bathroom there as I read in a prior review...but that was not an issue. Beautiful views from the top of the mountain and we had a few stops to take in the scenery and ask questions. The only negatives were some inaccuracies in the tour description: There were NO drinks/snacks included, we only went up ONE mountain, not two as stated in description, and we did NOT stop at a farm to see sheep, chickens, horses. But the tour was great, despite this. We had a beautiful sunny day for our tour and I would highly recommend this tour to others! were needed to be signed. I like that the Icelandic people don't make you sign a dozen forms before starting your adventure. a blast! We rode on the open road, up the hill tops and down around a lake. It was starting to get cold but we really enjoyed it. A great way to see the area. Just beautiful! I highly recommend for families with teens.